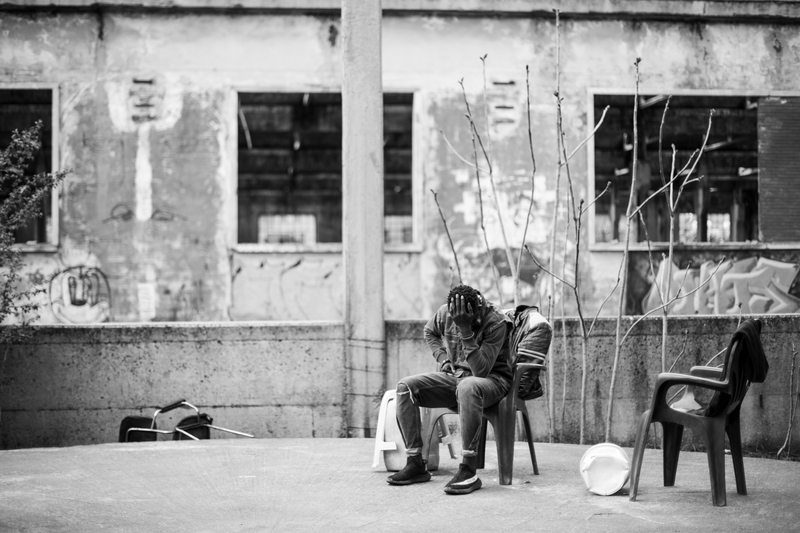 Reggio Emilia is the mirror reflecting the institutions’ indifference with respect to the informal refugee camps and the people hosted inside, such as the Gambian community that has lived in an abandoned building in the ex Officine Reggiane for five years. “I want to study music and be a DJ, says Simon while pretending to handle a mixer, but it’s difficult because I need documents and life is hard here at Le Reggiane”. Anyone who has passed through the city where the Italian flag was born will have certainly noticed huge buildings standing out on the historic train station’s rails. Those warehouses, that have been the region’s pride and fortune for years, are called by the locals simply “Reggiane” (adjective for Reggio Emilia). Simon is part of the Gambian community that has lived in the ex-factory abandoned building for five years. He has recently built a house few steps from Reggio Children, the worldwide famous research centre on education, and he invites us to enter. A big mural dominates the door displaying the words: “Scusa ma è un mondo di scuse” (translated: “Sorry but it’s a world of excuses”). Such is the access to a cold room that once was the workers’ locker room. An old consumed sofa and a mattress on the tiled floor are the only furniture he owns. Simon was a student in Gambia but today, 24 years old, he is no one. He says his home is temporary, that he will call a lawyer soon who will let him have the documents required to stay in Italy, while a bag of clothes and the creased pages of a diary are the only things he owns. In Gambia he was told to seek employment in Europe to support his family, omitting though to say that the travel would cost him many years of his adolescence and that he would end up in Libya working in the fields for cheap. 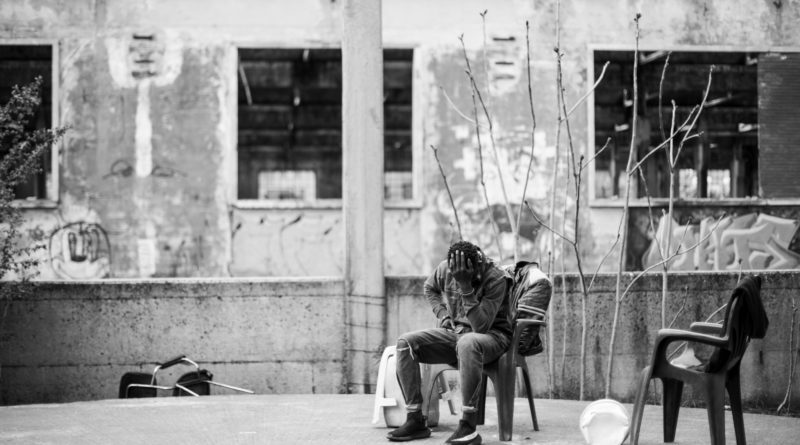 Today in Reggio Emilia, in the region’s biggest informal refugee camp, Simon fights against humidity, cold from the winter that just passed and the illnesses that he is doomed to bear after five years on the street. In his diary, half English half Italian, his words show through discomfort for a condition he does not understand, and anger for the time he is wasting. He is not a homeless, he has a home inside Le Reggiane and he belongs to a group of people who endure isolation from a society that repelled and forced them to settle while waiting for something to change. Walking among the huge warehouses, voices and laughters come from a small brick facility built before the factory was closed down. Here we meet King who invites us inside what is considered by the Gambian community as the communal room. Behind the curtains the place is hot and dark, a strong smell of moisture and sweat dominates the food aroma coming from the outside where lunch is being prepared. The room is divided into three spaces where three beds are fitted. On the right, next to the door, an electric heater proved to be essential to fight the wintery cold. A makeshift mezzanine sustains stacks of bags and suitcases full of clothes. According to the good hospitality rules, King offers us a hot tea in a cup without handle, and assigns the best chairs to us. King, 25 years old, left Gambia to find fortune in the so worshipped Italy. Speaking a perfect Italian he tells us: “I knew Italy thanks to a tourists’ restaurant on a beach I used to go to, where they made the typical Pisa cuisine. I had a long travel to Libya by car, in some countries I had to get off the road and proceed by foot because it was too dangerous”. After a long journey he exploited his carpentry expertise to earn a living. “I remember working Italian wood exclusively, and every time I saw the writing Made in Italy I was more and more convinced about where I wanted to go, even if in Libya one day you live, the one after who knows”, says looking down to his callous hands. Then the crossing, the rescue, and the reassignment to Rome where he stayed until he lost the right of asylum, then working in Locarno, Milano and Como until he came to Emilia-Romagna. Victim of a narration that depicts Europe as the promise land, the hope these people had is replaced with disillusion for a reception that failed and banished them in a ghetto closed by concrete walls, hidden from the eyes of society. The warehouses area, only slightly smaller than the historic centre, hosts a population of almost a hundred people. The residents’ nationalities are various: we can find groups of Maghrebians, Gambians, Ghanaians and Senegaleses who gave birth to a community parallel to the outer one. In a storehouse, once designate to sandblasting, a flushed Ghanaian cook prepares some turkey inside a big pot, black for the soot. The results of her efforts will be sold for cheap to the other residents. On the second floor, a big hall full of plaster flakes is the prelude to a series of cleverly built doors who host real apartments obtained from the spaces where employees used to work when the factory was still open. Paul has his hairdresser studio in one of these doors and, not far, Alvin fixes bikes of questionable origin in order to sell or rent them. As soon as the sun goes down behind the big roofs, notes of rap songs, chats and laughers rise from the lodgings. The communities have been stable in the area for at least five years, and they created a city within a city that lives and grows with completely different timings with respect to the hosting territory, without fresh water and safe electric systems. According to an investigative report published in March 2018 from Altreconomia, at least 22 thousands migrants have lost their right to be hosted in the Italian reception centres in the years 2016 and 2017: King and Simon are among them. Today, several people like them cannot make use of the services offered by the ‘legitimate’ refugee status anymore, such as access to medical care, psychological support and a safe place to live in. Moreover, Reggio Emilia appears to be at the centre of a tornado of rejections: in Bologna, where in 2018 2214 migrants are hosted, the prefecture arranged 2202 revocations. Modena places as number two in Emilia Romagna with 628 rejections, Piacenza is in third position with 265. According to the data provided by the UP road unit, which has been working on the emergency in Reggio Emilia for years, today the vast majority of people accessing the service are Centrafricans who either got out of the reception path or still pending. They are 18 to 30 years old. Their presence grew by the 236% between the second semesters of 2016 and 2017, replacing the presence of North Africans who were outnumbering in the past. Among different countries, many people come from Gambia (36%), followed by Ghana and Nigeria. Le Reggiane thus became a benchmark for the communities of rejected people who, especially during spring and summer when the winter dorms close, find hospitality and support among their connationals, therefore increasing the number of residents already settled in the area. On February the 8th 2018, Medecins Sans Frontieres (MSF) published Fuori Campo, the second report on the informal refugee camps’ situation and the social marginality on the Italian territory. The MSF statement points the finger against a system based on ‘extra reception units, with scarce social inclusion services’. Indeed, MSF spotted 47 informal camps in 12 different Italian regions, for a total amount of 10 thousand people not accessing proper hygiene and healthcare services. The report describes the size of the informal camps and, according to the appraisal, Le Reggiane would place in the medium range for population settlement. However, Reggio Emilia is not mentioned among the 47 reported cities, even if it hosts a manifest and declared humanitarian emergency since long time. The emergency, that with time became recurrent phenomenon, remained covered by a layer of indifference until three years and a half ago, when the ex-factory redevelopment began to make space for an Innovation, Knowledge and Creativity Park, created to host research laboratories, offices and university centres. Simon, as well as the other 100 people currently living in the area that will host the new district, was given a notification just few months in advance to move away and clear the houses to let the works proceed. Indeed, the Municipality has already arranged the evacuation and reallocation of the ‘legitimate’ residents to other facilities. But those who are left outside the structured reception paths will not have a place to live anymore: “they gave me this expulsion order and stated I cannot stay in Reggio anymore”, says Simon. “I have to go to Parma or Piacenza, but I don’t even know where these cities are”. The question, though, remains unanswered: to go where? Reggio Emilia is in fact the mirror of institutions’ indifference towards the informal camps and the people living inside. The ex Officine Reggiane case is a serious one, in which an innovation project looking towards the future has the power to impede official humanitarian emergency warnings to be made; on the skin of who, fooled by the promise of a future in Europe, gave birth to a community that is strikingly growing here, outside of a society that still turns aside from it.